Are You Experiencing Flooded Toilet Water Damage? We Can Help! No one ever thinks their toilet is going to leak. In most cases, your toilet will never leak. It will just overflow with water because of clogging or blockage. However, if you consistently have a clogging problem with your toilet which causes it to overflow, do not be surprised if it starts to leak soon or later. Once it does, the leak will cause major water damage to your bathroom and possibly your home’s structure. Even though home insurance covers this damage, you’re still looking at a high deductible and a minimum of $5,000 in damages from a toilet leak. If you want to prevent a toilet leak, then perform regular maintenance on your toilet. Do not over stuff the drain with toilet paper. If you need to use more toilet paper, try flushing the toilet periodically as you continue to use more of it. If you find that the toilet is not flushing the contents down the drain, then you already have a clogged toilet. Whatever you do, don’t pull the lever to flush again. Otherwise, you’ll definitely cause it to overflow. Every home bathroom should have a plunger in it. The most common way to unclog a toilet is to use a plunger on the drain. If you are successful, the toilet water contents should continue flushing completely. On the off chance that you do attempt to flush, and the water continues to rise, twist the knob under the tank to turn off the water. Clean up the water that fell onto the floor and call a professional plumber to handle the rest. 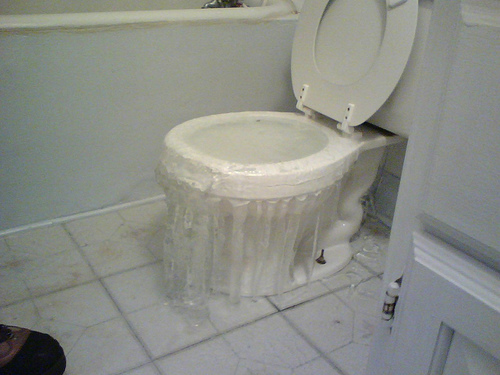 Toilet leaks can be hazardous to your health if they get too out of hand. Think about all the feces and raw sewage that exists in the toilet water. If these contents get on your flooring or carpeting, then your indoor home environment will become unsanitary. You can expect mold, fungus, and bacteria to grow there. Then you will have a much bigger job than just removing the water. You will need to hire a water damage repair person to sanitize everything with special chemicals. If the water damage was bad enough, any hardwood flooring or carpeting will need to be replaced. In conclusion, perform maintenance on your toilet every 6 months. Inspect the flush valve, chain, supply valve, and fill to ensure everything is functioning right. And if your toilet ever gets clogged, immediately use the plunger. Do not attempt multiple flushes. This is the best way to prevent overflowing and leaks. What Hides in Wet Carpet? 5 Fighting Tips How Long Does It Take for Mold to Grow?